Our tremendous journey has come to an end and the superlatives could roll off our tongues endlessly. We are still awed by this country – a nation full of great places we’ve probably never thought to explore, with the same linguistic and cultural diversity as the entirety of Europe, surprises waiting around every corner and a growing number of vibrant and innovative companies. 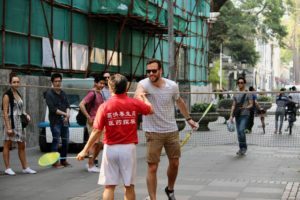 China, whom our hearts had grown so fond over this journey, enriched us in a very profound way, not only on a professional level but also on a personal level. So as of today, we mark the official closure of Insight China 2017. The Insight China team has been selected and we proudly pass the project to our successors – The stage is yours! We wish you, the Insight China 2018 team, all much success and energy in tackling the challenges that lie ahead of you. Finally, what remains to to be said is our infinite gratitude. A big shout-out and thank you goes to all our partners, speakers, companies, supervisors, lecturers and delegates that have made this incredible project possible!谢谢你! After we visited the two companies, Huawei and DJI, in Shenzhen, we headed off to Guangzhou on the next day for sightseeing. The fourth biggest city of China is also located in the South of China and belongs like Shenzhen to the Guangdong province. 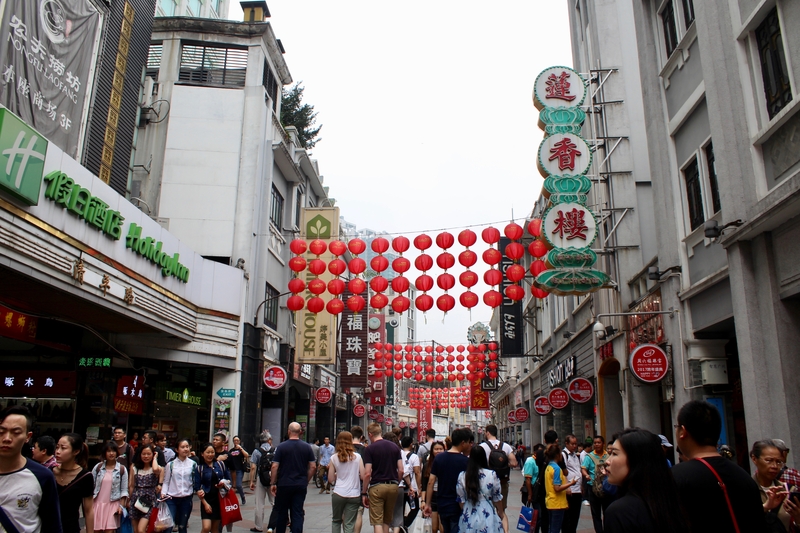 Even though the official language is Mandarin, the city has another three spoken dialects, Cantonese, Hakka and Chaoshan. We left the Sunshine hotel at around 9am and continued our onsite trip by bus. 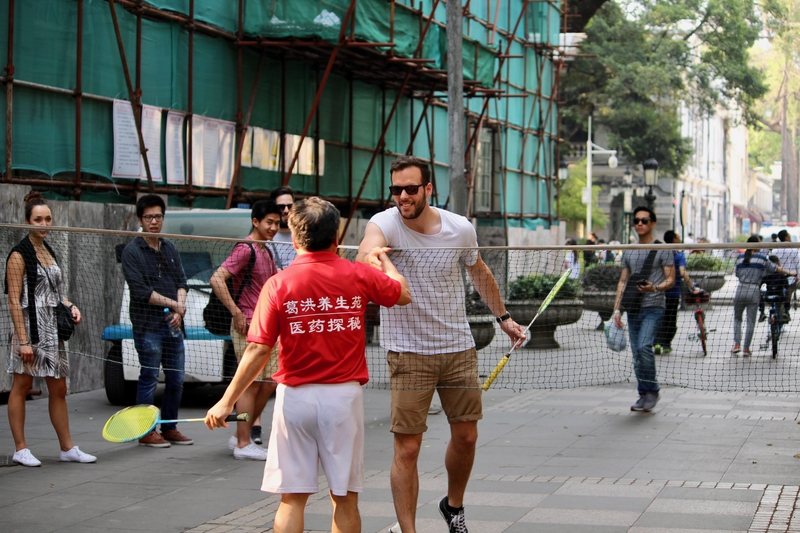 Our first stop was at the old town of Guangzhou, where we also met our guide Maggie. She shortly introduced herself and didn’t want to lose time to show us the most famous places, since we just stayed here for a couple of hours. The first thing I realized was that it was very crowded in the old town. She told us something about the food culture and that people here are used to eat everything, like chicken feet’s, from animals. Furthermore, a common word is “yam cha” which means “tea house”. People go to that place for breakfast or lunch and can enjoy fantastic steamed food. After a short walk through the street alleys we could look for lunch by ourselves. Some fellow students and myself ended up in a small Chinese restaurant, where we had some delicious Chinese food. Once we finished lunch we went back to the bus and drove to the Ancestral Temple of the Chen Family, which nowadays is used as a museum. The building was built in 1888 by the Chen family members. While we walked around, Maggie told us something about the history and its typical Cantonese architecture and folk arts. Our next and last sightseeing place was the Shamian Island, which had huge influence by the French and British people. We could walk around at the mesmerizing place with its beautiful architecture style. All good things must come to an end, as the last day of the Preparatory Seminar is marked by the Joint Friday. 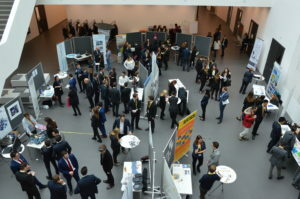 Traditionally, all four International Student Projects, Insight China, Focus India, ConnnectUs and exploreAsean are gathering together on this day. This year’s topic of the Joint Friday was fully dedicated to “globalization”. The Joint Friday was kicked-off by Jean-Pierre Lehmann’s presentation on Globalization – Prospects, transformation and challenges. Jean-Pierre Lehmann (D.Phil, Oxon) was Founder of Evian Group and is Emeritus Professor at IMD, Lausanne, Switzerland, where he was appointed to the Chair of International Political Economy. As explained by Jean-Pierre Lehmann, globalization is the integration of markets through cross-border movement of goods, capital, information, technology and labor. In fact, Globalization is a process. He refers globalization to Nassim Taleb’s term “Black Swans”, which are cataclysmic events with low probability and high impact. Examples are the stock market crash of 1987, the 9/11, or the financial crisis. By no means are black swans inevitably heralds disasters. The fall of the Berlin Wall and Deng Xiaoping’s open door policy can also be denoted as Black Swans. Furthermore he outlined five major revolutions that promoted the globalization process: ICT revolution, global market revolution, Chinese economic revolution, demographic revolution and the climate revolution. With the west turns towards protectionism, and Xi Jiping emphasized the importance of globalization in this year’s World Economic Forum, Jean-Pierre Lehmann is certain that the narrative of 21st century of globalization will be written in Asia. In the afternoon a panel discussion were held regarding globalization and its current issues moderated by Prof. Michael Jeive. The renowned panelist consisted of: Jean Pierre Lehmann; Dr. Jan Atteslander, Head of Foreign Trade at Economiesuisse; Dr. Rudolph Strahm, former price surveillant and national council; Dr. Kristyna Ters, lecturer at FHNW and research fellow at the Bank for International Settlements. The time was clearly too short to cover this topic more thoroughly, but the discussion gave some great insights for us. Thereafter, the career Fair was set up and running with numerous companies from different fields. Career planning, leverage the professional network, or CV-Check, the participants made full use of its opportunity. Still require a CV photo? 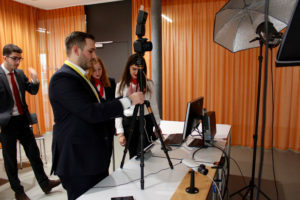 A Photo booth was set up, while pictures were professionally taken by Julien Weiler (PR-Team connectUS). Last but not least, an aperitif marked the end of this year’s preparatory seminar, accompanied by the alluring sounds from a live piano playing. Herewith, the Insight China Team would like to thank all speakers, partners, delegates and participants that have been part of this successful week. This year’s Preparatory Seminar would not have been possible without you, 谢谢你! Did you know that number four is an unlucky number? The Chinese words for four sound tonally nearly the exact same as the word for death. In contrary, our program on the 4th day consisted of valuable learnings and rememberable highlights. Right at the start we were split into four groups and were handed with a task: Sell your idea in a five-minute business pitch. The clock was ticking, with 60min to develop a business idea. From revolutionary bicycles, 5D Fitness-room, to the Swiss Experience Room, the delegation were extremely creative. Shortly after the group’s business pitches, we voted for a team with the help of a phone app, except one’s own group. The winners were rewarded with Victorinox Swiss army knifes and DIWISA vodka. Thereafter, a photo session was planned. The makeup is perfect, the hairdo is in place, and the camera is set – Time to take worthy pictures! The afternoon was devoted to this year’s preparatory seminar highlight – The panel discussion regarding the middle-income trap. 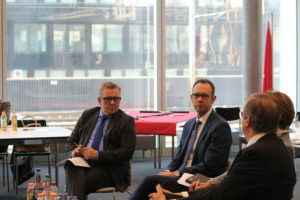 The roundtable consisted of high-regarded guest speakers: Janwillem Acket, Chief Economist Julius Bär; Elisabeth Tester, Co-Founder ChinaIntelligence and Lukas Züst, Counsel & Head China Desk at Vischer AG with Prof. Michael Jeive, Managing Director of the FHNW Swiss SME Research Center China as the moderator. So what is the middle-income trap? The middle-income trap is the state in which a country’s growth slowdowns after reaching middle-income levels. Over the last three decades, the Chinese economy has grown at an average pace of 10% per year, which is about three times the global average. That wave of growth has transformed the middle kingdom from a low-income to a middle-income country. Today, China finds itself facing challenges that are characteristic for middle-income countries. In 2015 China recorded its slowest growth rate in 25 years with 6.9%. The factors that stimulated the country’s rapid growth have started to evaporate. The question remains whether or not China’s economy can continue the growth in the past and ultimately transform into a high-income country. In the discussion the panelist all agreed that the government identified the challenges and need to work on their implementation. While improving entrepreneurship, developing suitable legal frameworks and reinforce innovation are considered as key to overcome the middle-income trap. Undoubtedly this is a daunting task for the government, the panelists however believe that China will avoid the middle-income trap. 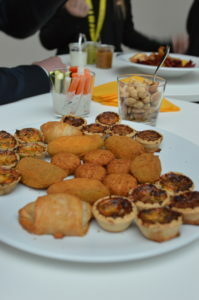 The highly interesting panel discussion was followed by an aperitif. Fine dining and drinks were the icing on the cake of this successful day. And so is the Preparatory seminar more and more drawing to a close. Now there is one thing left: The Joint Friday! Finally the time has come; the eagerly awaited Preparatory Seminar has officially started! The Preparatory Seminar gives a thorough introduction to life and work in China and is the ideal preparation for the On-site Seminar trip. 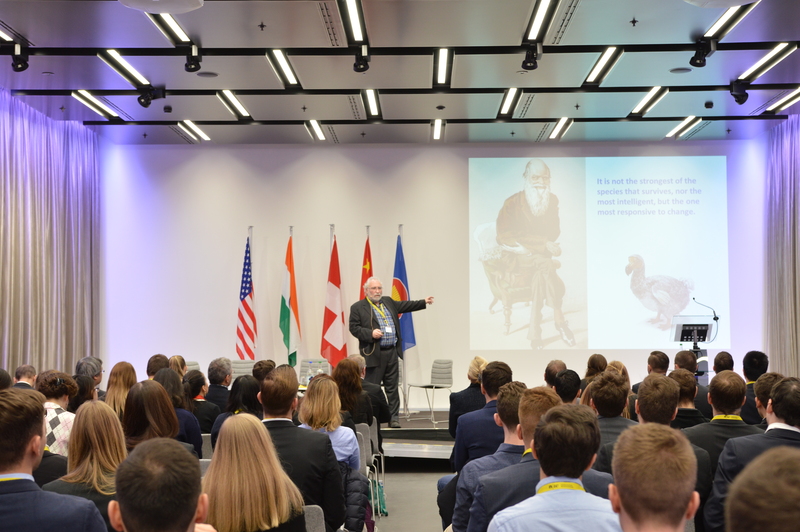 From culture, history to the economic development – the program is fully packed with interesting topics. The first day started off with a joint introductory remark by Prof. Dr. Ruedi Nütz, Director of School of Business at FHNW. Shortly after, Prof. Dr. Ruedi Nütz joined us to kick-off our individual seminar. 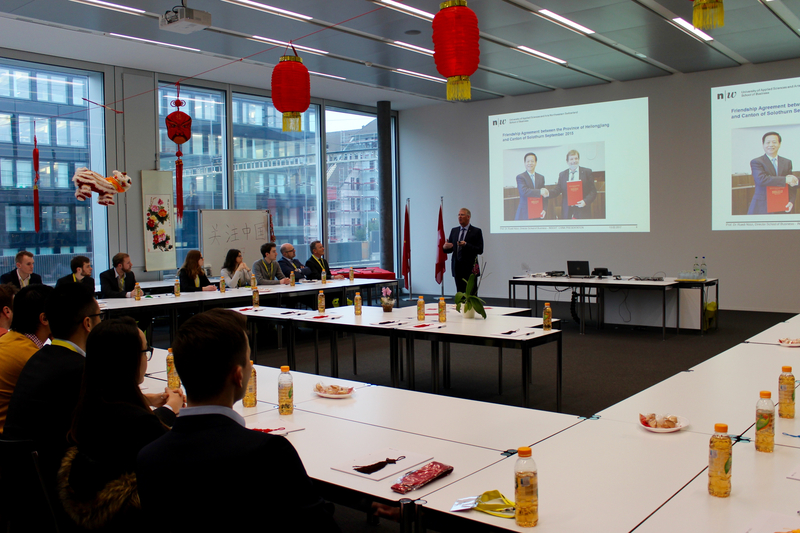 In his presentation, he outlined the prosperous relationship between the FHNW and China. The school’s longstanding history of intensive exchange with Chinese universities and institutions is remarkable. 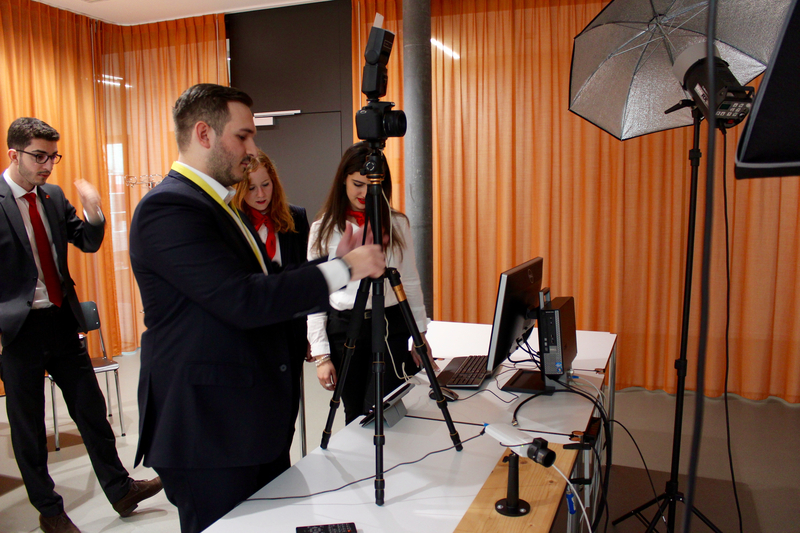 For several years FHNW has built a network in China that is second to none. 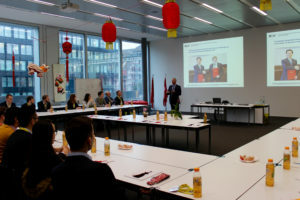 With the establishment of its own Swiss SME Research Center in China, the school is capable to provide consultancy services to numerous Swiss companies, who want to gain a foothold in the Chinese market. After all, building genuine partnerships in China does not always work smoothly and is further complicated by cultural differences. 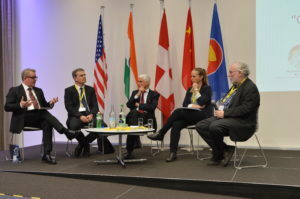 However, we should take a less anxious view of these issues and have a positive attitude towards them, as Prof. Dr. Ruedi Nütz explained: “China is for myself a positive challenge”. Next, Prof. Dr. Peter Abplanalp gave us insight into the history and development of China. As one of the world’s oldest civilized nation, China has a rich and profound history. 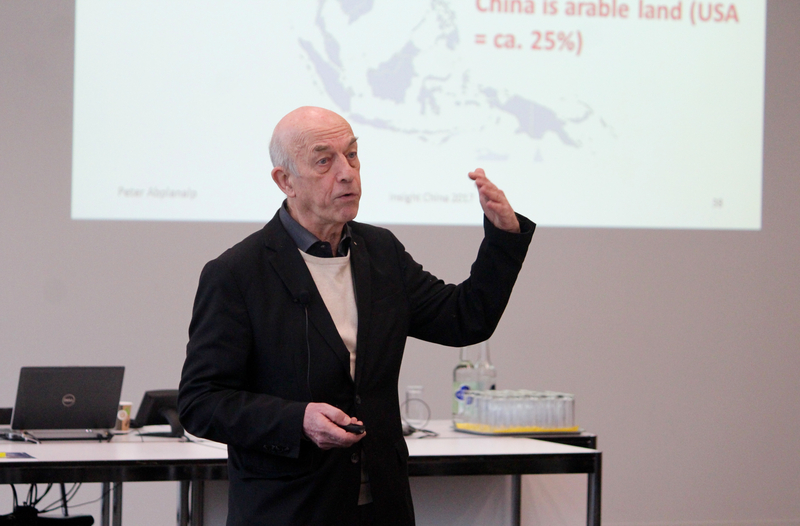 “Until the 15th century, China was a world power and a country with a highly developed civilization”, said Prof. Dr.Peter Abplanalp. He further explained that China is in a state of continuous change. Take for example the 19th century; China had undergone five revolutions during that century. These are only small a proportion of knowledge that Prof. Dr Peter Abplanalp shared with us, in fact he provided us with tons of interesting facts and figures. With a wealth of learnings, time passed quickly in the morning. Interestingly, both speakers in the morning have been honored with the Friendship award. The Friendship Award is China’s highest award for foreign experts who have made significant contributions to the mainland’s economic and social development. 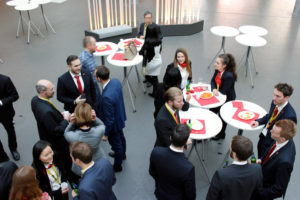 In the afternoon the delegation were split into two groups. 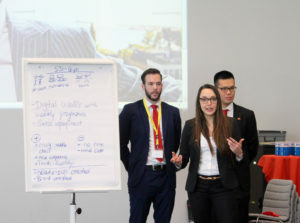 Workshops in Chinese Business Etiquette and Chinese language were on the agenda. With Dr. Shuguang Yuan the delegation underwent a crash course in Chinese language. He teached us the principles of the Chinese languages inclusive practices in pronunciation. 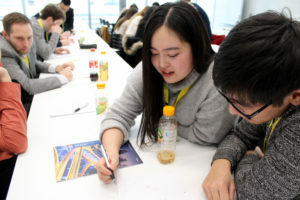 In addition, we had been introduced to Chinese calligraphy, learned the basic structure of the Chinese character and practiced to write our own names in Chinese. Avoiding cultural pitfalls in China? Yingbo Seiler-Zhao guided us on basic business etiquette of Do’s and Don’ts in China. For instance, present and receive gift with both hand is as equally important as greeting the most senior person first. 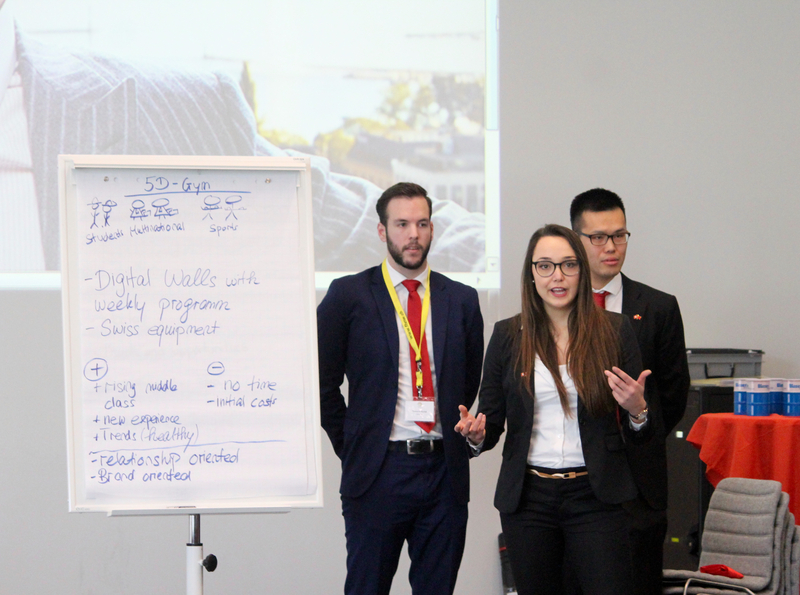 We then put theory into practices by simulating a business meeting between Swiss and Chinese people. 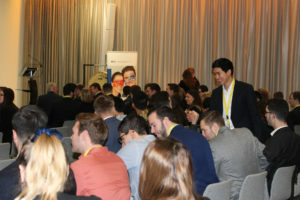 Eventually, the first day slowly got to its end and the delegation has already gained a tremendous amount of knowledge. That is a promising start into the week, while more exciting speakers and company visits are ahead!